Let's just call this the "before" picture. I'm guessing I'll be able to take the "after" picture in two days, with the snow all gone. 37º today, but 48º tomorrow and 53º the next day. Snow showers, maybe :) We got it here in Indiana, too. 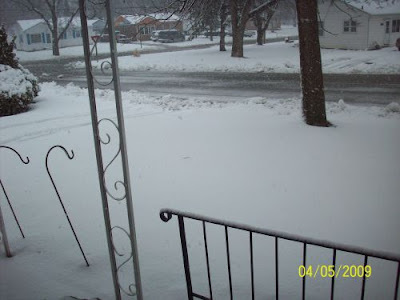 I talked to my son-in-law in northern Minnesota the other day, 17 inches of snow in 24 hours. Yep, Spring is in the air! Wow... 17 inches! We've had lots of snow in short amounts of time in the past, but I can't ever recall that much! Yep, you can just smell that fresh spring air!